The Fourth of July is synonymous with cookouts. It's a day for burgers and hot dogs, potato salad and a cooler full of icy beers. (And, oddly, mattress sales.) Though life would be best lived if every meal on Wednesday came straight off the grill, that probably won't be the case. However, in honor of Independence Day, restaurants across the US are offering alluring freebies and deals that will make you want to fill your craw full of chili dogs and funnel cake. Here are all the places where you can taste the freedom. 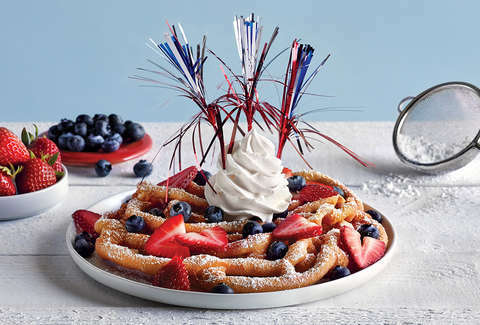 The deal: When you dine in, say "free funnel cake" to your server and you'll get just that, a warm funnel cake dusted in powdered sugar, strawberries, blueberries, and whipped cream. Limit one per person with the purchase of an entrée. 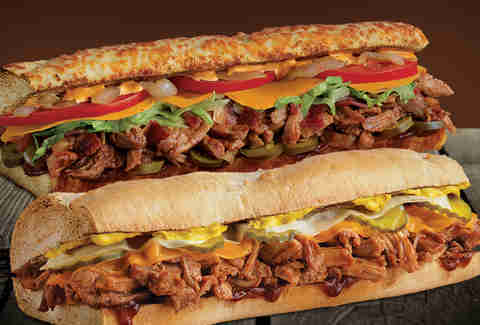 The deal: Participating Quiznos around the US are offering buy-one-get-one-free (BOGO) BBQ pulled pork subs through the Quiznos Toasty Points loyalty mobile app. The deal: Get BOGO bagels from the Flavors Across America series when you flash a local ID. The deal: If you stop in for a signature Frappe, you'll get a coupon for a free Frappe on your next visit, including new flavors like Honeydew Coconut, Cotton Candy, Matcha Green Tea, and Horchata. The deal: Get a free kids buffet with the purchase of an adult buffet. The deal: Buy a large one-topping pizza and get a medium one-topping pizza for just $0.04. The deal: White Castle will be offering 20% off online and app orders with the promo code "FOURTH." The deal: The hot dog hub has a bunch of cheap food packages in its "Crowd Pleasers" deals, including three medium fries, three chili dogs, and three hot dogs for $10. See all the deals here. The deal: The alcohol delivery service is offering $10 off your first order with the code "INDEPENDENCE." The deal: Houlihan's is reimagining its popular Long Island Iced Tea for the Fourth. The $5 'Murica LIT is the classic Long Island "patriotically garnished" with a Bomb Pop popsicle. As American as jet skis and t-shirt cannons. The deal: The Cafe's Fourth of July happy hour features cheap drinks, including beers for as little as $2. It also has half-price appetizers to fill your belly before you head out to the fireworks. The deal: The cafe's Red, White and Brew deal offers local craft beer paired with either the chicken-fried ribs or a steakhouse burger for $11.99. The deal: Take 20% off everything in the online shop with the code "JULY4" and $1 off everything in the Culver and Pasadena stores. The deal: If you're looking for a massive basket of cookies for a party (or for yourself), you can take 30% off the cookie company's Stars and Bites Forever Basket. It contains 120 small cookies, 72 brownie bits, and 12 large cookies. The deal: Buy an adult entree and two beverages, get a second entree for half off, per Offers.com. The deal: Pick up Jimboy's signature taco burger and fries for just five bucks. The deal: My Pretzel Perks members can take $1 off any pretzel and drink combo. It'll appear under your account in the app. The deal: Pick up any small classic or signature sandwich, a bag of ships, and a small fountain drink and it'll only run you $5. The deal: The customizable wine subscription is offering free shipping on its introductory box with the code "FIREWORKS." 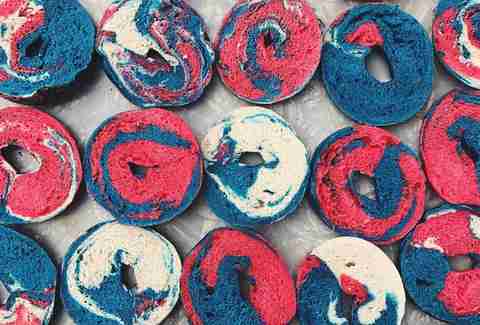 The deal: There's no discount, but you can start your morning with red, white, and blue bagels from Bruegger's. The deal: The home of the Blizzard is releasing two limited edition "Americana-inspired" Blizzards for America Day. The Star-Spangled Blizzard is full of rock candy blended into vanilla soft serve and topped with blue rock candy and the Stars & Stripes StarKiss Frozen Treat. (Yeah, it's a popsicle on top of the Blizzard.) The Oreo Firework Blizzard is loaded with red and blue popping candy, Oreo pieces, and vanilla soft serve. More Fourth of July Deals? If you know of Fourth of July freebies and deals we missed, email us at news@thrillist.com and we'll add 'em here.